Hiking nutrition for day hikers and backpackers may not be the first thing you consider when planning your hike. Eating the right food for hiking, regardless of length of trip, is a big deal. Your body needs fuel before, during, and after the hike. So that explains the big appetite that goes along with big hikes. Think of it as "refueling"! Do I hike to eat? You bet! And so should you. Check out how many calories you burn on your hike. This big calorie burn can be used to your advantage if you're hiking for weight loss. 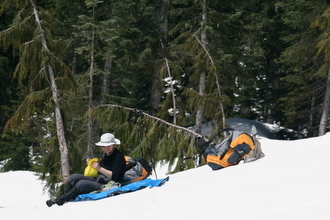 And if you winter hike (also known as snowshoeing), you'll need even more calories to keep yourself warm and fueled. Not all hiking calories are created equal. 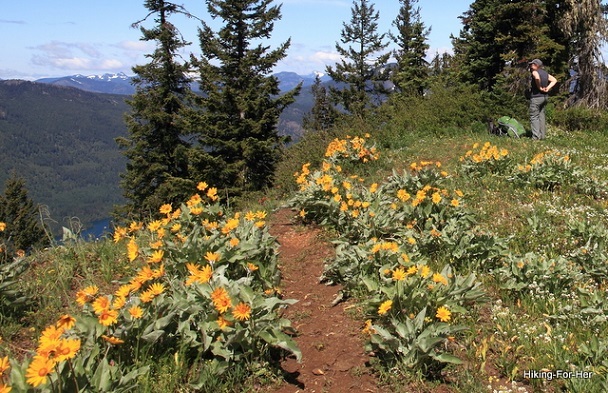 I wonder how many calories it took to get me up here so I could enjoy these balsam root flowers? Oh yeah, and that big view. Trail food selection is a vast topic, so use that link as an overview. But it's a smart idea to break it into the type of hiking you're planning to do. There's tasty, and then there's tasty AND nutritious. Some hikers rely upon tried and true portable foods such as jerky and bags of gorp (good old raisins 'n peanuts - although they get pretty fancy these days!). But there are many creative ways to pack proteins, carbohydrates and fats in a hard working hiker's lunch sack, without overdoing it. Here's an ever evolving alphabetical list of great day hike nutrition tips! It's easy to overlook food safety on a day hike. It's also easy to read these tips on how to keep your food safe on a hike. If you've never done one before, use these overnight planning tips first. Then turn your attention to your menu. Weight is an issue when you're gone for one night or doing a weekend trip. Taste is a definite concern. Easy preparation needs to be taken into consideration, to maximize your precious time on this short trip. As you plan, don't neglect taste, nutrient content, and ease of preparation after a long day on the trail! Make your own dehydrated food? Or purchase the light weight freeze-dried stuff? Stick with a tried and true company like Mountain House? Need some backpacking food ideas? Are you a beginner backpacker food planner? Want to go organic for your next backpacking menu? What about paleo backpacking food? Only bring satisfying backpacking food. And select the best backpacking nuts for protein and healthy fats. Select your protein sources carefully. Favor rice as a backpacking staple? Choose the right types for you! Don't forego daily vitamin C just because you can't carry fresh fruits and vegetables. HIKING RECIPES: I may not be able to create a great backpacking recipe, but I know one when I taste one! Snacks every so often along the trail are important bribery components of any hike. I myself use them to keep my motivation, as well as my energy level, as high as possible on a hike. Here are my favorite hiking nutrition tips for hiking snacks! Yummy, and worth the weight. Try something different on your next hike, including good-for-you dark chocolate. If that luscious red berry or glistening mushroom looks tempting, then you'd better know what you're doing, right? all provided by Mother Nature. Sometimes you just can't carry enough of the right types of food to keep yourself out of a nutritional hole. That's when lightweight supplements and supportive nutrients can play a big role in keeping your stamina high. You mean water is cellular fuel? Water is a required daily nutrient, biochemically speaking. Your trillions of cells are water-based chemistry labs. The right type of clean water, in the right amount, is essential to feeling good on the trail. As important as the right mix of carbohydrates, fats and protein! That's why staying hydrated should be a top priority on the trail. And what about water in the form of sports drinks? But the most important thing: make sure your hiking water is clean and free of microscopic trouble makers. Here's how. Have you ever heard the expression "You are what you eat?" The reason I bring up these cliches is to urge you to consume the best quality carbohydrates, proteins, and fats you can afford (see above). But we need to go a bit beyond that. You are what you digest and absorb. And that requires a bit of knowledge about the human digestive system. If you're getting feedback from your gut (pain, unease, gas, bloating, weird stools), listen to another tried and true saying: "Go with your gut." When your body sends you a message, heed it or ignore it, but it won't go away. Guess which choice makes sense for a smart, savvy hiker? You just might need to go gluten free on the trail! Maybe you only want only the best ingredients in your hiking food. I agree! And if you're an older hiker (at least 45 years and approaching menopause), you might find this hiking nutrition information useful. A backpacking stove is a major decision to make, so use these tips. You'll need some lightweight, durable kitchen essentials. And some tips for keeping your cooking pot, utensils and dishes clean so you can completely avoid food borne illness. I happen to like reading medical research articles on nutrition and fitness because it might contain a nugget of wisdom to make me a stronger, happier hiker. I never know what I'm going to stumble across, on the trail or in the library! So send me your questions about hiking nutrition, or hiking in general, and I'll do my best to find answers. You can receive timely hiking nutrition nuggets, free of charge, just 'cuz I want to make you a stronger hiker. Let me read through the geeky jargon, and give you the bottom line on all things hiking, including what to eat (or not) for better performance. I also try to cover the latest news in hiking injuries, gear developments, good deals, useful resources for hikers, breaking news, and whatever is on my hiking radar. It's free, it's easy to sign up for my newsletter, and it's even easier to unsubscribe if you don't find it useful. And of course I don't share your email address, or use it for anything other than delivering the monthly hiking news to your virtual inbox! Just pop in your email address, and watch your inbox for the next edition. And while you wait, enjoy the back issues. I've pulled together lots of useful detailed information to answer your questions about which trail foods to select for day hikes, overnights, and longer trips. Take a peek at available titles in my Fast Hiking Facts. Fact filled, but never boring. No hype, no fluff, only the good stuff you need!